Before you leave, remember to turn out the lights. Permalink: Before you leave, remember to turn out the lights. Tea? You mean like dry, dead plants in hot water? Permalink: Tea? You mean like dry, dead plants in hot water? Fatima: How is Edward Morrison? Sam: He's not so good. He's dead. Permalink: He's not so good. He's dead. You never have to worry about me. Only the good die young. Permalink: You never have to worry about me. Only the good die young. You do not just take no for an answer. Permalink: You do not just take no for an answer. No balloons, no dog. Where's the joy? Permalink: No balloons, no dog. Where's the joy? I'm feeling hot, because Kensi is on fire. Permalink: I'm feeling hot, because Kensi is on fire. 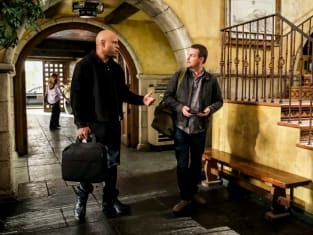 Callen: I'm thinking of getting a pet. Sam: That's a terrible idea. Permalink: That's a terrible idea. Maybe we should get Mr. Rogers a sun lamp and a rock, for basking. Permalink: Maybe we should get Mr. Rogers a sun lamp and a rock, for basking.